Colm, trying to convince the crowd of the merits of wine. Ha! The beer/cider vs wine smackdown at Savour Kilkenny? There was some serious argie bargie going on in the lead up to the event, especially from my team of dastardly valiant opponents, Ballymaloe wine lecturer Colm McCan and Pascal Rossignol of Le Caveau wine merchants in Kilkenny. It was a simple idea: we wanted to figure out what goes best with food. On the beer/cider side, I would say – of course – local beer and ciders; wine pros will always argue that wine is the better match. There was only one way of finding out. We had tastings of local food, each matched with a particular beer or cider, and a wine. Colm talked wine, I countered with beer and cider and the audience got to decide – using Colm’s highly questionable voting system. The smackdown started ever before we met on stage. But the boys didn’t have it all their own way. I called in support from the beer tent next door – hard to beat producers bringing in and talking about their own beer. A big thank you to Gerald from Costellos Brewing Company and Metalman’s Grainne for helping me to push back against the wine boys. In an effort to stay local, I even poured Kilkenny’s Costellos red ale from a Nicholas Mosse jug to accompany Lavistown sausages. I was accused of milking the local angle. Despite the fact that we came down to a draw on both days of the smackdown, that hasn’t stopped my wine friends from continuing the debate. Next year, boys, we’ll do it all again at Savour Kilkenny – only beer and cider will come out on top this time! Thanks to all at Savour Kilkenny and Kilkenny Leader for their help in getting the event together and a big thank you to all the fantastic producers who gave us samples: Goatsbridge, Lavistown Sausages, Knockdrinna Farmhouse Cheese, Breagagh Meats, Highbank, Costellos Brewing Company, Longways Cider, Metalman, Eight Degrees Brewing and Le Caveau. Colm and Pascal showed superb wines over the two days, not to be sniffed at, even if you’re in competition with them. The books, beer and brownies tour continues with events in Dublin, Waterford and Cork in the next few weeks. Come along and meet us! 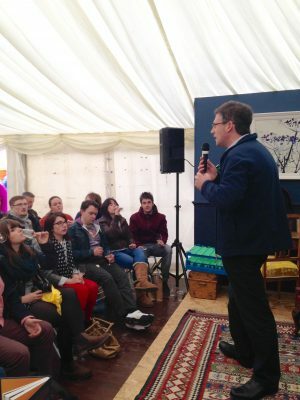 Bibliocook - All About Food > Work > Demos > Beer vs wine at Savour Kilkenny: a draw?